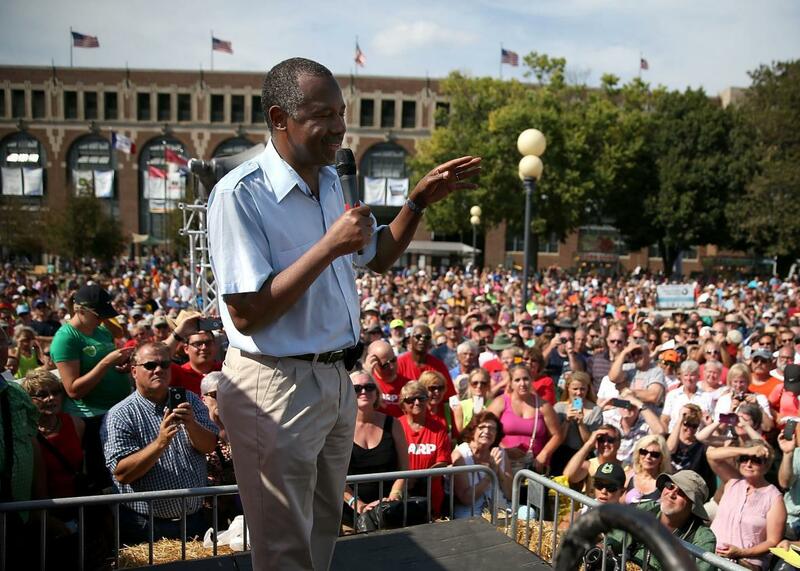 Iowa poll: Carson is five points away from Trump while Clinton falls below 50 percent. Support for Donald Trump has surged in Iowa over the past few months, soaring to a comfortable first place with the backing of 23 percent of likely Republican caucus participants, according to the latest Des Moines Register/Bloomberg Politics Iowa poll. That marks quite a boost from the four-percent support that the real estate magnate received in May. But retired neurosurgeon Ben Carson isn’t far behind, receiving the support from 18 percent of likely caucus participants. And, significantly, when first and second choices are added together Carson and Trump are tied at 32 percent. All the other candidates have single-digit support with Ted Cruz and Scott Walker tied at eight percent and Jeb Bush and Marco Rubio at six percent. Although Carson may be five points behind Trump, he has him beat in the favorability rating with 79 percent saying they view him favorably while only eight percent have negative feelings about him. Trump’s favorability rating, however, is nothing to sneer at with 61 percent seeing him positively and 35 percent negatively. That is quite a contrast from the May poll that showed 63 percent of likely Republican caucusgoers viewing the real estate magnate negatively. Five months from the Iowa caucuses, the anti-establishment sentiment that many had predicted would pass appears to be getting stronger. That could be significant if it pushes more people to attend the caucus, which is a key part of Trump’s campaign strategy. On the Democratic side, Bernie Sanders has also seen his support increase in the past few months and he is now within seven points of Hillary Clinton. While Clinton retains the lead with the backing of 37 percent of likely Democratic caucusgoers, 30 percent say they would pick Sanders. It was the first time Clinton fell below the 50-percent mark in the Des Moines Register/Bloomberg Politics Iowa poll. Vice President Joe Biden, who has not announced his candidacy, would receive 14 percent support in the caucus, according to the poll. Without Biden as a choice, Clinton’s support rises slightly to 43 percent. “These numbers would suggest that she can be beaten,” said Steve McMahon, a Virginia-based Democratic strategist.